Administrators can set a schedule for when agents appear online by enabling operating hours. Any schedules you create in Zendesk Support will not transfer over to Zendesk Chat. Note: If you enable operating hours, your widget can only be online during the operating hours you've set. If an agent logs in outside of operating hours, their status is Invisible by default. If the agent tries to manually change it to Online, it's automatically set back to Invisible. Enabling operating hours overrides any idle timeout settings agents have set up under Settings > Personal > Idle Timeout tab. From the dashboard, select Settings > Account > Operating Hours tab. In the upper-right corner of the page, click On. Select the type of schedule you want to set up for your account. Account schedule is a single schedule that applies to your entire account. Department schedules lets you apply multiple schedules to a department or apply multiple departments to a single schedule. Daily: Allows you to set separate hours for each day of the week. Weekday/Weekend: Allows you to set the same hours for every weekday (Monday to Friday) and both weekend days (Saturday and Sunday). Ensure the check box is selected next to each day of the week that has operating hours. If a day has no operating hours at all, clear the check box next to it. Adjust the sliders next to the days to select the hours agents are available to chat. Note that operating hours must be at least one hour and can be scheduled in 15-minute increments. If you're using department schedules, click the link to also add departments to the schedule. Note that you must add at least one department to each schedule for department schedules to work. 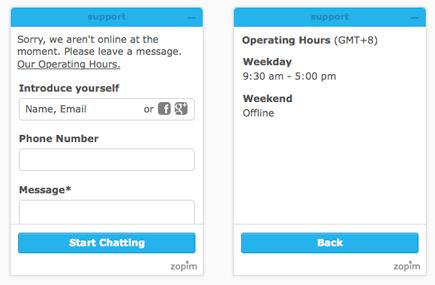 If you want to show your operating hours on to visitors on the chat widget when the widget is offline, select the Display Operating Hours check box. For details, see Displaying operating hours on the widget. For changes to take effect, make all agents log out, click Forget me, and log in again. If you've configured the Offline Form to appear (Settings > Widgets > Forms > Offline Form), you can also show operating hours show on your offline widget. Select the Display Operating Hours check box. Where you review your schedules after you've set them up depends on whether you're using account schedules or department schedules. Go to Settings > Account > Operating Hours tab. Go to Settings > Departments and click on the department with the schedule you want to review. The schedules appear in the Operating Hours section. The hours that appear here take into account all of the schedules applied to this apartment. So, what happens on a chat that was requested during operator hours, but operator hours were passed and that chat is still waiting to be served? Will the offline form automatically display or will that chat be left open for agents to serve? UPDATE: for anyone reading this, Zendesk Chat support told me that the chat offline form will only automatically pop up (replacing "the waiting to be served") for those customers that have initiated a chat request within operating hours but were still waiting to be served by agents after operating hours have ended, if all agent either have their status to Invisible or have logged out of Zendesk Chat. So, if you have 10 customers still waiting to be served after your operating hours have ended, you have the option to either serve them (no new requests will come in at this point, since your operating hours prevents this), or to have all your agents go invisible/log off, which will force the chat widget to display the contact form to any customer still waiting to be served. Note that having your agents go invisible won't prevent them from completing any ongoing chats. If you choose to not "clean up" any requests waiting to be served after your operating hours have ended, you might want to complement this with a time based trigger message that sends a friendly message some time before the end of your operating hours, informing any customers requesting a chat but still waiting to be served that chat will soon close, and the customer will get a contact form option instead (if you have the offline form enabled of course). Is there a way of displaying the same operating hours' message for mobile app integration? what about international configurations with brands in different time zones ... information here is too basic. Is it possible to have (for example) 9-5 with an hour lunch break? is it possible to display the operating hours of each department, no display account? it always display the account operating hours on the top. @Alejandro Currently, the mobile SDK does not support the displaying of operating hours. @Lone Prairie Camp this possible when using the department schedules. You can create two schedules for the same department and it will display the break on the widget. Thanks. If you use $zopim.livechat.departments.setVisitorDepartment('客服協助') to pre-set the visitor department, it will be selected in the form and the operating hours dropdown. There is a section that states "Enabling operating hours overrides any idle timeout settings agents have set up under Settings > Personal > Idle Timeout tab." This is not true. I have operating hours set and I idle out at 1 hour all day every day, as thats what I have my idle timeout set as. So I dont understand why this article states this. Secondly, on 12/21 a chat was allowed to come in 2 hours after our "Schedule" was set to close? Even if a rep forgot to log out this article states " Note: If you enable operating hours, your widget can only be online during the operating hours you've set. If an agent logs in outside of operating hours, their status is Invisible by default. If the agent tries to manually change it to Online, it's automatically set back to Invisible." Then why was a chat allowed to come in 2 hours after closing time? This, along with not having the ability to log out reps manually and not being able to set a separate Holiday schedule makes Chat with Zendesk very frustrating to use as a frontline rep and as an administrator. Hey John, it sounds like you are bumping up against some unexpected behavior. Because of this I am going to create a ticket on your behalf to allow for a more in depth conversation on what may be going on. You'll hear from me via email! Is it possible to switch the widget to show the clock in 24 hours format on web? Our business hours lands across midnight and the display of '12:00 am' is pretty confusing. For example, it can be misinterpreted as that our support hours is 1 hour instead of 13 hours, and 3 hours instead of 15 hours. We're experiencing the same issue John mentioned. We only started experiencing it in December. We use strictly Department hours (all Account hours were switched off for all options for both "Daily" and "Weekday/Weekend"). Initially we used 3 schedules of online hours, with all 3 of our departments added to each schedule. All departments have the same users. Basically, Schedule 1 toggles our main support hours, and Schedule 2 and 3 are used when I need to take the whole team offline in the middle of a shift to ensure we can schedule those offline hours ahead of time. So, for example, if we have two 30-minute meetings on a given day, one at 2-2:30pm and the other at 4:30-5pm, then Sched1 might state 7am-2pm, Sched2 might state 2:30pm-4:30pm, and Sched3 might state 5pm-7pm. In the past, this worked perfectly. Zendesk Chat would go offline as expected and then come back online as expected. However, since December, this has not functioned properly. The issue seems to have gotten worse since the start of this year. We've missed numerous chats coming in after we're supposed to be closed and offline. I did some troubleshooting and it appears that there's a malfunction with the "online schedule" [Daily | Weekday/Weekend] settings within each Schedule’s operating hours setup in Chat > Settings > Account > Operating Hours. My assumption after testing is that the issue lies with "Weekday/Weekend" because that experiences the glitch most often. everything initially appears fine. When I select Sched1 and pick "Weekday/Weekend" from the dropdown, I see both options are disabled. However, when I next pick "Daily" from the dropdown, all days are now active for 9am-5pm. Also, after waiting 15 minutes, the account still has not gone offline. everything again appears fine at first sight. When I select Sched1 and pick "Daily" from the dropdown, only Wed 9am-5pm is checked. However, when I pick "Weekday/Weekend" from the dropdown, both options are now active for 9am-5pm. And yet again, the account fails to go offline at all, even after waiting 15 minutes. I then tried a different tack, removed 2 departments, and for the remaining department (let's call it Dep1), created 2 separate online schedules, then disabled one of those schedules so I only had one active online schedule enabled. When I repeated the above troubleshooting steps, I experienced exactly the same issues. No matter what I do, I can't force a selection purely for Daily or Weekday/Weekend. When I want to restrict options for Daily, Weekday/Weekend automatically populates all options for 9am-5pm. When I want to restrict options for Weekday/Weekend, Daily automatically populates all options for 9am-5pm. This extends to all schedules for all departments I've created, whether isolated (by disabling all others) or used in conjunction with each other. There is no permutation that solves the problem. This is incredibly frustrating and seems to defeat the purpose of this function. Please note that I'm using Chrome 71.0.3578.98 (active instance extensions: Session Buddy, AdBlock, Pocket, Zoom) on a Mac running OS X El Capitan 10.11.6. I also encountered the problem on a PC using the same Chrome build and instance in Windows 7. I cleared my cache on both machines before testing (cookies, images, hosted data). No other web apps I've used on either machine in the past month seem to be malfunctioning in any similar ways. I will submit a ticket for this to your support team to investigate, but hopefully you see this as well. Maybe I'm just missing something obvious. If I am, please let me know. If not, please note that this issue is seriously messing with our ability to serve customers reliably. Thank you! @johannes - We're experiencing a similar issue, where we have two departments (in this case distinct groups with different agents and customers) that have Chat. The second group just launched this week. On Friday's the two group shave different operating hours, but the system allowed all chats to proceed through based on the longer operating hours, causing one team to miss a large number of interactions. Have you made any progress identifying a solutions? @Tyler - No, we still haven't made progress. I submitted a ticket on Wednesday evening but haven't heard anything back from Zendesk yet. I have 3 different time zones that we work in so tried to schedule 3 different departments with my local time zone. It doesn't work. I am not sure if I have to make my Account settings 24/7 and also enable the schedules? but when I disable the Account setting and enable the schedule the chat doesn't show up for any of the department websites. I have resorted currently to enabling the account setting 24/7 and making my agents use the Idle feature so that they are invisible when a chat comes up in the other time zones. This seems like a definite bug. Unless I am doing something wrong??? Is there perhaps a way to make it that the widget displays when the department is offline without giving the option of a dropdown to the customer to chat with another department? Seeming that I can't get the chat option to disappear when none of the agents for that site are available? What you're describing is expected behavior, so I wouldn't so much call it a bug as it has to do with how you're routing the chats and configuring the departments. Routing chats with the department setup you have right now by way of triggers won't work and the widget will display when other agents in the other departments are online, anyway. Consider the JS option explained in that article and let us know if you have any followup questions! The ongoing chat should not be disconnected once the end of operating hours kick in. The agent should be able to deal with the customer after the set schedule. If you are consistently experiencing chats getting disconnected after the end of the schedule, please email chat@zendesk.com to get further assistance.